Can Rahul Gandhi put 292 dead cats on the table? Home Opinion Can Rahul Gandhi put 292 dead cats on the table? 2019 is nigh and it will be raining dead cats from the Modi campaign. Presuming that the 2019 Lok Sabha elections will be held on the same dates as 2014, the last day of campaigning will be 10 May 2019. That’s 292 days away. To make any significant impact this election, Rahul Gandhi needs to put 292 dead cats on the table. When you put a dead cat on the table, no one can ignore it. Everyone will talk about it. In the process, you have succeeded in making sure people don’t talk about what they planned to. 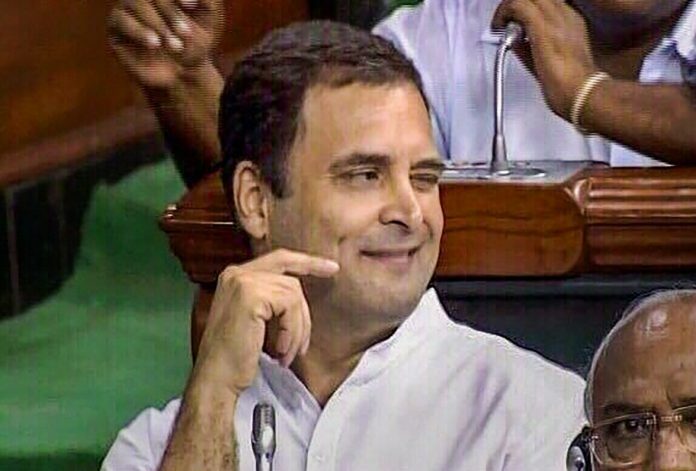 Rahul’s hug, even his wink, was a dead cat on the table. Without the hug, the headline would have been ‘Modi wins trust vote’. People would have been talking about how poor the opposition numbers looked, how opposition unity is still a chimera, and how Modi gave another bombastic speech on the historical wrongs of the Congress party. Rahul’s hug-and-wink changed the conversation. All opposition politicians who complain that a biased media doesn’t give them space should note that even the most pro-Modi media outlets could not ignore the Rahul hug. They may have trashed it but they could not ignore it. The Hindi proverb “Badnaam hi huay tou kya, naam tou hua” comes to mind. Politicians like Narendra Modi and Donald Trump win even when they lose because they always occupy your mind-space. Whether Modi does right or wrong, whether he fails or succeeds, whether he goes to Uganda or Uttarakhand, whether he’s in Parliament or inside the NaMo app, he’s always occupying your attention. As the 2019 election approaches, there will scarcely be a space where you won’t find a Modi poster. In the post-Modi era, elections are about occupying mind-space more than delivering any development. This is what partly explains the power of Brand Modi to win elections for the BJP despite its failures. The BJP should not have won Uttar Pradesh after the failure of demonetisation was clear, it should not have won Gujarat after the troubles caused by the hasty implementation of GST, and it should not have emerged as the single-largest party in Karnataka with a discredited Yeddyurappa as the local face. But Modi makes sure you always think of Modi more than you think about GST, demonetisation or the BJP’s uninspiring local leaders. What was that fitness challenge about? Everybody’s asking what happened to ‘Acche Din’, and Modi is asking celebrities to post fitness videos on Twitter. How does that make any sense? Modi posts his own exercise video for which he gets ridiculed endlessly on social media. A million memes make fun of the Prime Minister’s fitness regime. Yet these memes only help Modi because they make sure you think only Modi, Modi, Modi. Just think of all the terrible Bollywood movies we watch just because the producers carpet-bombed us with pre-release publicity. Not watching the film would then make us feel like we missed something. It is the success of the Bollywood publicity machine that people often say they went to see the film with low expectations. If you didn’t expect it to be worthy of your time why did you go for it? Modi, then, is the political equivalent of the Salman Khan Eid release. Wu draws a distinction between “attentional contests” and the “contests based in merit”. In the case of Trump, as in the case of Modi, you can’t win just because you are right, or better. You have to win the attentional contest. Merit doesn’t matter. That is why one hug and wink can’t do it. Over the next nine months, Modi will put one dead cat on the table after another. He will make us talk about what he wants us to talk about. He will make sure that his supporters, his critics and the fence-sitters talk about Modi, Modi and only Modi. One hug and one wink won’t do it for Rahul. He needs his own 292 dead cats on the table. I don’t understand why the author wishes to promote negative politics. Does he want to ruin this country forever. ?What a shame? Better option for Pappu is to develop himself like a commedian. Mr. Beans is no more now and Pappu can definitely be new Mr. Beans. As of now Pappu is always finding a dead cat on any happening whatever. Even if he is has stomach upset, he will blame it on Modi. It is going to be a ‘Blame it on Modi’ till 2019 elections results. It is wrong to conclude that this election is going to be BJP vs Congress only. Somewhere it may be BJP vs Shiv Sena, some place it may be BJP vs SP-BSP, BJP vs TMC, BJP vs TDP and may be BJP vs BJP in pockets. I think the trailer will come in December from Rajasthan, MP and Chhatisgarh. Interesting days ahead. As you have said most of the media is biased due to fear. Bring out the truth. You have not brought out the big questions ,he asked in the parliament in respect of rafel deal, failure of promises made, raising of Petroleum prices etc. Media’s role is very important to bring out the real picture. Better congressees leave this dead cat business to BJP and concentrate to put 292 knots in Maha-Gut- Bandhan so that it doesn’t Snap well before the hustings. Modi is a Lier , Cheated people of India, He is not even truthful to his wife. Stupid with fake Certificate . Talks like a clown. China infiltrated India 30 time in the month of May alone . “You have to win the attentional contest. Merit doesn’t matter.” It applies to Rahul than Modi. I do not know about positive contribution of a negative action. Do not know about benefit from a dead cat. One point is sure. It was few negative actions of Congress which became self goals and added more votes to Modify ji in 2014. 3. Recently Aiyer comment on Modiji as a neech person only added votes in states election..
5. So, his Hug in parliament to Modi ji and subsequent eye wink certainly made the entire nation to talk about him,, but certainly as a man without maturity or dignity or decorum. It is not clear as to how you you advocate that even his negative actions will bring him seats.. It was kinda cute — the hug that wasn’t. Rahul’s effort, to qualify as a hug, required some visibility of Modi’s palms/arms on Rahul’s back. There wasn’t any. It was more like the forcible nestling of a man-child into the spacious chest of a “loved” Daddy-o, to seek absolution for his rebellious impertinence. ‘I did not mean it Papa. I do not hate you. I love you. It was all Sachin’s fault.’ Kind of cute. Irrespective of whether it’s the BJP or the Congress that can put more dead cats on the table, if these mind games are going to determine who’s going to run the country for the next five years, then what future do we look forward to? On top of that there are visible positives in my workspace and society that I can correlate with Modi’s policies. On that basis, even if it was a one-to-one give and take, I would vote Modi alone. Well said. We have in MODI a PM who is actually working – literally 365 days @ 15-16 hours per day. And importantly he has a Vision for India and working with full enthusiasm towards the same. My vote is for Modi. Just to be clear, he does rallies for even municipal elections for BJP is it on our time? What you fail to understand is something called “total utility” and now people are bored seeing the same stuck-up face everywhere, secondly you can’t fool people all the time and this time around Modi will be scaled on performance and fyi the so called wave gave him a 32% vote share and surely he has lost considerable ground. Gujarat he was almost in tears but the mistake Congress did was they didn’t go for an alliance the same in Karnataka if they would had done a pre-poll alliance BJP would had been lost then UP had a split BSP and SP but this time around it will be different. Modi knows it’s time up to pack up and all by-elections have shown him the door. So stop your rubbish analysis and get real. Cheers!! Keep putting Pappu on the other side and you are ensuring a walk over. Leaders have to get voted out because people are fed up of their faces; what a naive assumption. Leaders get voted out because of bad governance or poor alternatives. Guess both are true these days. The fake gandhis will be hanged publicly THEY ARE SO HATED IN INDIA.